The Pride Rally 4 wheel scooter is an economy sized, all purpose indoor/outdoor 4 wheel scooter. 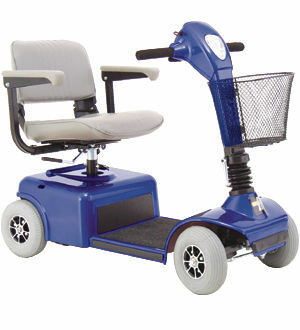 It features great maneuverability and a smooth comfortable ride with the stability of a 4 wheel scooter. What makes the Rally so exciting is that it's priced like an economy scooter, yet has many of the features of a luxury scooter, such as standard front headlight, 300 lb. weight capacity and easy disassembly. this scooter easily breaks apart into 5 pieces, with the heaviest piece weighing only 45 lbs.! The swivel seat and flip up arm rests add to the comfort of the scooter, making it the best value of a 4 wheel , economy sized scooter on the market today! Advanced acrylic urethane paint finish. Wheel Size 2.5"" x 9"
Seat height adjustable to 3 positions. Weight w/ batteries 116 lbs. Easily accessible on board charger.